Størrelse for denne PNG-forhåndsvisningen av denne SVG-filen: 249 × 249 piksler Andre oppløsninger: 240 × 240 piksler | 480 × 480 piksler | 600 × 600 piksler | 768 × 768 piksler | 1 024 × 1 024 piksler. Kilde Extracted from PDF version of the Federal Reserve's Purposes & Functions document (direct PDF URL ). Public domain from a copyright perspective, but other trademark-like restrictions apply. 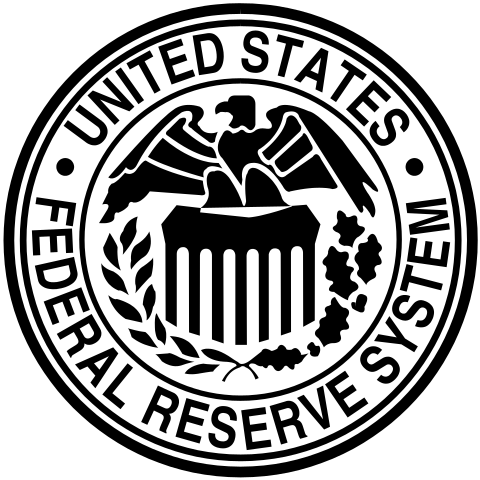 The symbol may not be used to convey the impression that a nonmember bank, banking association, firm or partnership is a member of the Federal reserve system (per 18 U.S.C § 709). Also see 18 U.S.C § 701. 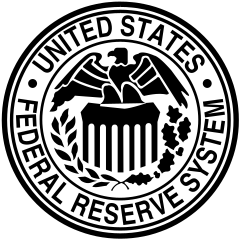 This work is in the public domain in the United States because it is a work of the Federal Reserve Bank or one of the twelve Federal Reserve branch banks which are owned by the US Government. However, 38% of all banks in the United States are "members" of the Federal Reserve System. They are all owned by their stockholders, not the Federal Government, so this template cannot be used on their works.